NASA and the Department of Defense Human Space Flight Support (HSFS) Office Rescue Division are conducting a search and rescue training exercise over the next several days at the Army Warf on Cape Canaveral Air Force Station and in the Atlantic Ocean. 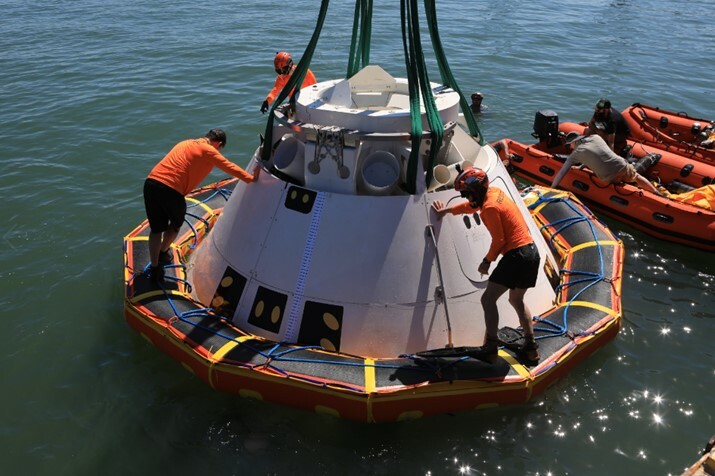 This is the first at-sea exercise with the Boeing CST-100 Starliner training capsule, known as Boiler Plate 3, ahead of the commercial crew flight test with astronauts targeted for later this year. 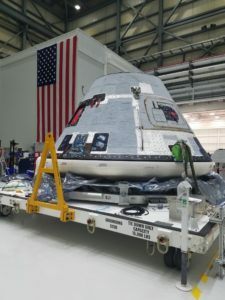 The HSFS teams have supported all NASA human spaceflight programs and will be on standby for both NASA’s Commercial Crew Program and Orion launches and landings. The team is responsible for quickly and safely rescuing astronauts in the unlikely event of an emergency during ascent, free flight or landing. This multi-day exercise consists of ground- and water- based training to prepare the DoD pararescue team for an emergency situation on ascent. The HSFS teams will rehearse locating the Starliner spacecraft, sending out rescue teams to extract DoD team members, acting as astronauts, from the capsule and providing immediate medical treatment. The HSFS team will arrange for pickup, transport and follow-on medical care. At the conclusion of this exercise, HSFS will complete a full mission profile to validate best practices for configuring and air-dropping U.S. Air Force Pararescue team members from a C-17 aircraft with their associated watercraft, specialized rescue equipment and advanced medical capabilities. 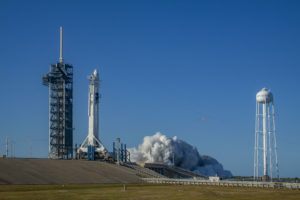 HSFS conducted a similar exercise with SpaceX’s Crew Dragon spacecraft in early December 2018. This simulation is another example of how safety is being built into systems, processes and procedures for commercial crew missions. It is standard practice to conduct these exercises, and was regularly done during the Space Shuttle Program. During normal return scenarios, Boeing’s Starliner will land on land in a safe zone of about 15 square miles in the Western United States. Throughout the commercial crew development phases with NASA, Boeing has performed dozens of qualification tests on its parachute and airbag systems simulating conditions on land and in the water. To be honest, I’m shaking, and I’m super excited. It was an incredible journey to get to this moment. The teams have just done an amazing job, both the SpaceX and the NASA teams jointly. Fundamentally this is a great day for the nation, for SpaceX, for NASA, for all of us—really for the world. I think it was Anne (McClain) who said this is the first time in 40 years that we’ve had a spacecraft designed for humans (test) fly, and not only did she fly and go to the space station and do everything she was supposed to do, but we brought her home safe and sound landing in the Atlantic. It’s amazing. I can’t believe how well the whole mission has gone. I think on every point, everything’s been nailed, all the way along—particularly this last piece. We were all very excited to see re-entry and parachute and drogue deploy and main deploy, splashdown—everything happened just perfectly, right on time the way that we expected it to. It was beautiful. As a team, SpaceX, we’re just super honored to have the opportunity to have done this mission, to work with NASA, to work through this. You know, Demo-1 is fundamentally this first major milestone in our process towards certification. I always like to remind everybody that this is a whole system—there’s Crew Dragon, there’s the Falcon that’s going to be certified to fly humans, there’s also the ground systems, the operations, our entire factory and production system—everything that we do is being certified to be able to fly astronauts safely, and this is a huge step towards that. If you kind of look back over what happened over the last two days, which just seems incredible to me, really it’s the culmination of years of work to get us to this day. We had launch, Crew Dragon deployed, and we saw beautiful free flight. One of the things that’s hard to test when you’re on the ground is how fluids work in microgravity. And what’s amazing is everything worked just like we expected. We got to station, docked, and, you know, it’s the first time I think in history a commercial vehicle and also an American vehicle has docked autonomously to the International Space Station, so that’s super cool. (Crew Dragon was) loaded with all kinds of sensors, all kinds of tests that we did. We all met Ripley, and she’s loaded with sensors so we can understand exactly all the forces that the crew will feel as they’re launched to station from home. We got to meet the little Earth guy (laughs); I heard he’s going to stay on station. Undocking, of course, some more free flight, and then we came home. We jettisoned the trunk, closed the nose cone, and then again, like I said, just beautiful parachute deployment, everything the way we expected. All of these tests that we’ve been doing on parachutes, all of the analysis that we’ve done on understanding the aerodynamics of re-entry and coming home. Everything was just wonderful. The important thing now is we’re going to take all of this data and we’re going to apply that to the next steps. There’s a lot more to do because our ultimate goal is to be able to continue to staff space station, to provide astronauts rides up to space, give them a safe place to be, a safe place to come home in, and do crew rotations every six months. So how do we get there? So we finished Demo-1, huge milestone, the next step is we take that data, we apply it, we learn from it, and we’re going to go to our in-flight abort test, similar to that pad abort test that we did a few years ago. We actually will put the same Dragon that we flew on Demo-1, we’re going to take that and we’re going to put it on top of Falcon 9, launch it, get it going super fast to test conditions, and then escape it off of the rocket and again do the same thing, bring it home safely under parachutes, land it in the ocean. From there, after we get that done, we go to Demo-2, and that’s kind of like, wow, that’s the big prize, because that’s going to be sending Bob (Behnken) and Doug (Hurley)—our NASA astronauts, our partners, our friends—sending them up on Dragon and taking them to station safely and bringing them home safely. When that’s done, we’ll go through final, full certification and start those six-month rotation missions, which we’re all so excited about. It’s important to take a step back and think about all that it took to get here, all the work of all the joint teams—NASA and SpaceX—all the support that we’ve had from friends and family. Really, I think, the most important thing is that on behalf of all of the 6,000 people here at SpaceX, we really want to thank NASA, we want to thank the space station, the international partners, and thank the American public for their support and partnership as we go through this. We’re really proud to be part of this endeavor. It’s great to be here representing the Commercial Crew Program. What an outstanding day to be part of our program. We started our contracts in 2014 for these first missions, and to sit here today and talk about Demo-1 and how great the flight went and what we’re going to learn from it is just amazing. I’d like to congratulate the SpaceX team on a phenomenal job getting the vehicles ready and executing the flight, and our whole NASA team that worked the mission. If you just think about the enormity of what happened in this flight and all of the prep that went into it—getting the pad refurbished at (Launch Complex) 39A, getting the flight control room set up, getting the vehicles built, getting the Falcon 9 ready, all of the analysis, all of the mission support that went into it, the simulations and the practice leading up to this flight over the last year or so—it’s just been a tremendous job. I would say one of the things that we learned during this flight is the great relationship we have between the program and SpaceX. I would say our teams worked seamlessly back and forth with SpaceX, not only in the lead-up to the flight but in how we managed the flight through the Dragon mission management team, and then also working with Kenny Todd and the International Space Station Program. The space station program did a phenomenal job supporting our program while we were docked to station, on the way to station, and the international partnership as well, so it was a really great opportunity for this mission. The last 24 hours have been exciting for us. You know we closed the hatch yesterday around noon (Central Time), got into the undock today around 1:31 a.m. (Central Time), did a few small separation burns to get away from station—if you watched that on NASA TV that was flawless—did about three separation burns to get down below station, executed the deorbit burn at about 6:52 a.m. Central Time and then landed just a few minutes ago at 7:45 a.m. (Central Time). The vehicle is doing well. The recovery crews are out on the scene. They’ve already been around the spacecraft and made sure it was secure for personnel. It was a very calm day with low winds and low sea states, and one of the chutes kind of landed on the Dragon capsule; they’ve already gotten that off, so that’s going really well. It’ll probably take 30 minutes to maybe an hour to get it back on the ship. When you look overall at this mission, it was a great dress rehearsal for Demo-2. We learned a phenomenal amount in the prelaunch timeframe about how to load the vehicle, and thinking forward to how we’ll put the crews in the vehicle. The ascent profile for this flight, we practiced the exact profile that Mike Hopkins and others will fly very soon—Doug Hurley and Bob Behnken (on Demo-2). We had the abort system—the crew escape system on Dragon—actually enabled for this flight, and we were able to see how that worked and we’ll get the data back and look at those triggers and how it performed. On-orbit we got a lot of great data on the vehicle in terms of the thermal performance and power performance; the vehicle really did better than we expected. Then the rendezvous was phenomenal as we came in and checked out those sensors. During the attached phase of course we had cargo operations, and we’ll do the same thing both on Demo-2 and then Crew Dragon-1 and other missions. Then we did a robotic survey of the vehicle to look at the thermal protection system and other systems, and that went really well. I will say one thing: this mission, it was only six days long. It was a sprint from start to finish, and thinking about where we’ve been in operations in that sprint, I think Kenny (Todd) would probably tell you the same thing—it was just a phenomenal job by the team. And then of course today, the undocking, watching how those systems performed, that went flawlessly. It’s a very tight sequence between undocking and de-orbit burn, how the nose cone performed, how the de-orbit burn was executed, then the entry was phenomenal. We did have Ripley on board, an anthropomorphic test device, and that’s going to give us a lot of important data for the accelerations during both the ascent phase and then the entry phase under the parachutes and then landing. So we’ll collect that data, and then look at that. Over the next few weeks, we’ll be doing post-flight reviews. In fact just next week we’ll have one for the launch vehicle and the ground segment at Kennedy Space Center (KSC), we’ll start reviewing that. And then subsequently we’ll do reviews with SpaceX on the orbit phase of the mission. This flight really sets us up well for the rest of the year. The vehicle that’s hit the water in the Atlantic today will be the in-flight abort vehicle, and so one of the first things that’ll happen is the vehicle will come back to KSC and go over into the processing area and start getting refurbished for the in-flight abort test which should be in the June timeframe. And then the Demo-2 vehicle is in Hawthorne, CA getting ready for the first crewed mission. That’s in progress and going well. That work has continued all through the flight, so it will be a busy year for us with SpaceX with in-flight abort in the June timeframe and then Demo-2 later in the year with the first crewed mission. I don’t think we saw really anything in the mission so far—and we’ve got to do to the data reviews—that would preclude us from having the crewed mission later this year. If you look in the April timeframe we’re also getting ready for the Orbital Flight Test for Boeing, and that will happen very soon. So our program will transition after this mission and the data reviews into preparing not only for in-flight abort and Demo-2, but also the Orbital Flight Test—the uncrewed flight test—for Boeing, and that’ll be coming up in the April timeframe. Spacecraft 3, which is the Boeing vehicle, is coming together at the Commercial Crew and Cargo Processing Facility down in Florida. And (Boeing) is in the middle of a bunch of very critical testing right now out at El Segundo (California) to verify that the spacecraft can work successfully in space. And then later on this year we’ll have the Crew Flight Test for Boeing as well. If you just look at all the activities in commercial crew, it’s a super busy time. 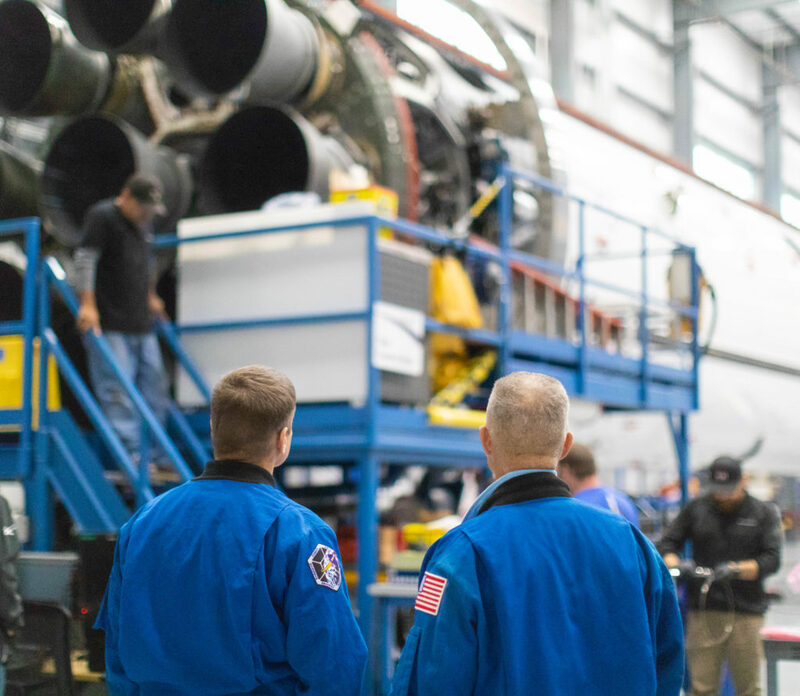 In addition to this flight, in the last few weeks we did parachute tests for SpaceX and Boeing and so if you look at all of the activities to get ready for flying our crews, it’s just a very exciting time. Again, congratulations to our SpaceX team and all of the NASA people across the country that worked so hard for many, many years on this flight. It really sets us up for the rest of the year, and it’s a super exciting time to be in commercial crew. NASA’s Commercial Crew Program (CCP) features a new generation of American spacecraft and rockets that will fly astronauts to the International Space Station, boosting the orbiting laboratory’s total crew to seven and expanding its capabilities as a one-of-a-kind microgravity research asset. Today, astronauts living aboard the station must balance time to devote solely to research with maintenance work critical to their safety while in space. Adding just one additional crew member could nearly double the amount of time the crew members could dedicate to research and scientific discovery. Flights to the space station with CCP partners Boeing and SpaceX could pave the way for more private research opportunities, too. Much of the technology developed on or for the space station has a direct benefit here on Earth. 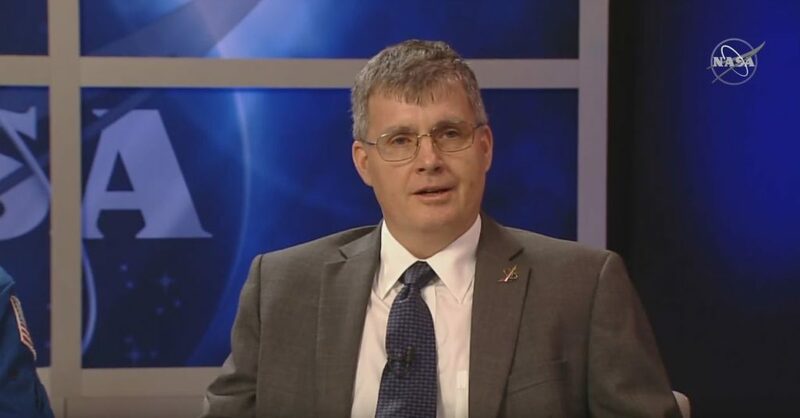 As an example, David Brady, International Space Station program scientist, says, “Robotics that have been so important in the building and the maintaining of the space station have come down to Earth in the form of robotic surgery.” Between the technological advancements and the ability to study and observe the impacts of living in a gravity-free environment, the space station has become paramount for advancements in research and development. With a greater focus on research through CCP, investigations conducted in low-Earth orbit will also be key to understanding how to better prepare and protect crews for future missions to the Moon and Mars. Studying how organisms react to life with and without gravity will provide the pathway toward understanding how humans could live other places in the solar system, thus paving the way to test how astronauts could leave Earth for years at a time for a roundtrip to explore Mars. With this understanding, astronauts will truly be able to go where no one has gone before. NASA’s Commercial Crew Program (CCP) and private industry partners, Boeing and SpaceX, are on the verge of making history with the return of human spaceflight launches to the International Space Station from United States soil. 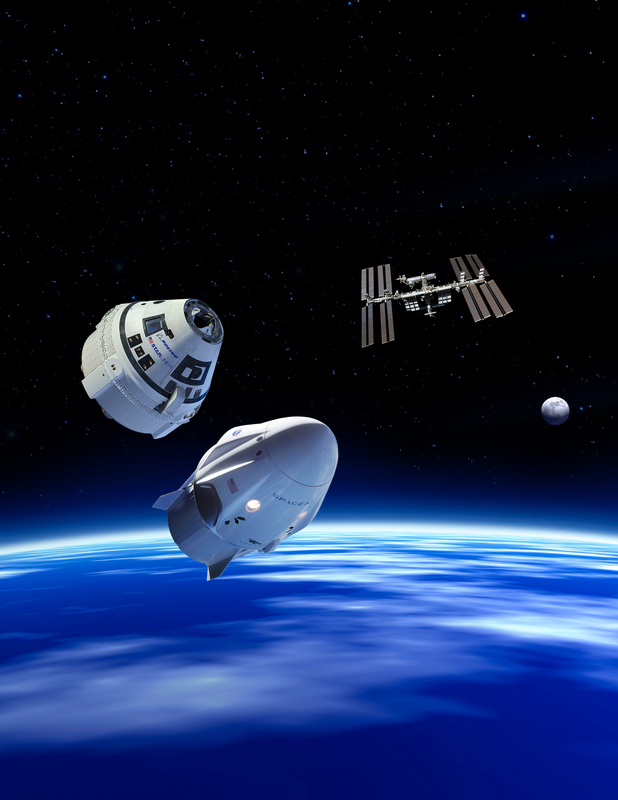 The upcoming flights of the SpaceX Crew Dragon and Boeing CST-100 Starliner spacecraft will be the first time NASA has sent astronauts to space on systems owned, built, tested and operated by private companies. By allowing industry to provide transportation services to the space station, the agency can concentrate on developing emerging technologies for exploring distant destinations well beyond low-Earth orbit such as the Moon and Mars. 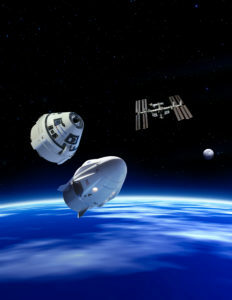 In September 2014, the agency announced the selection of Boeing and SpaceX to transport U.S. crews to and from the space station. This also will mark the return of launching U.S. astronauts on American spacecraft and rockets to low-Earth orbit since the final space shuttle mission in 2011. The inaugural flight of SpaceX’s Crew Dragon, known as Demo-1, will be uncrewed and is designed to validate end-to-end systems and capabilities, leading to certification to fly a crew. SpaceX’s first crewed flight, Demo-2, will fully demonstrate the company’s ability to safely fly NASA astronauts Bob Behnken and Doug Hurley to the space station. Behnken and Hurley have each flown two space shuttle missions. In the near future, the uncrewed, opening act for Boeing’s Starliner, known as its Orbital Flight Test, will demonstrate the human transportation capabilities in advance of certification to fly astronauts to space. 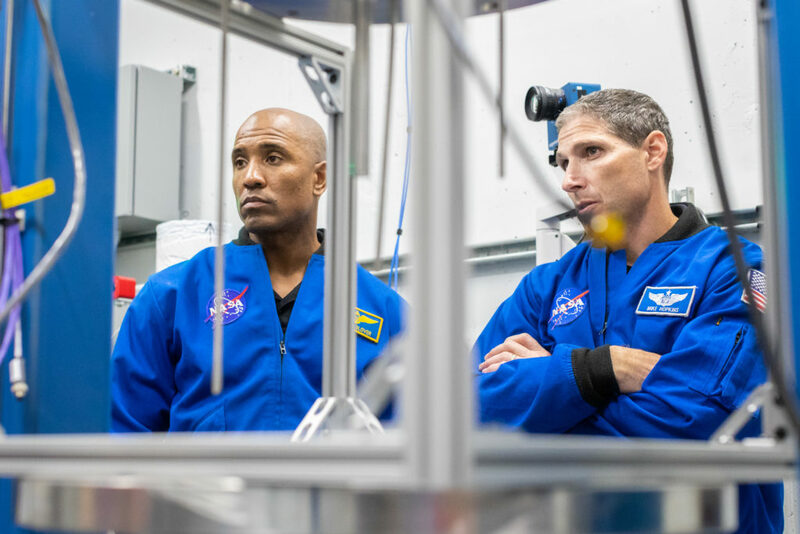 The first flight with crew aboard a Starliner, the Crew Flight Test, will fully demonstrate Boeing’s ability to fly humans safely to and from the International Space Station. 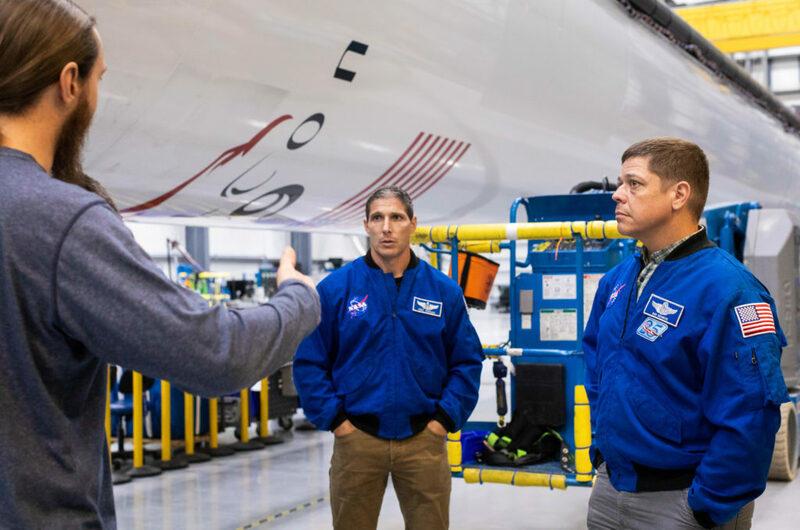 Onboard will be NASA astronaut Mike Finke, a veteran of three spaceflights; NASA astronaut Nicole Mann; and Boeing astronaut Chris Ferguson, who previously led Starliner’s Crew and Mission Systems and flew three space shuttle missions. CCP will provide safe, reliable and cost-effective access to low-Earth orbit destinations, and it will end reliance on Russian Soyuz spacecraft. As a result, the station’s current crew of six can grow, enabling more research aboard the unique microgravity laboratory. These adjustments allow for completion of necessary hardware testing, data verification, remaining NASA and provider reviews, as well as training of flight controllers and mission managers. The uncrewed test flights will be the first time commercially-built and operated American spacecraft designed for humans will dock to the space station. The first flights are dress rehearsals for missions with astronauts aboard the vehicles. Commercial crew has continued working toward these historic missions throughout the month of January. 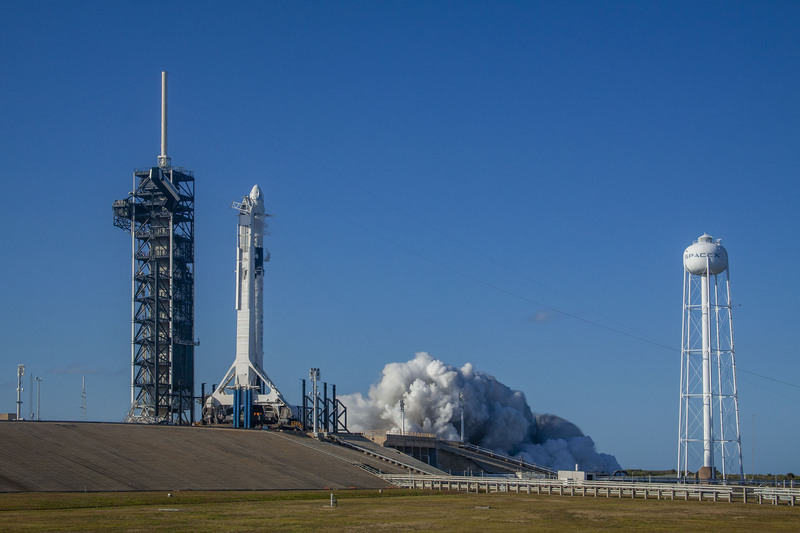 In January, SpaceX successfully completed a static fire test of its Falcon 9 with Crew Dragon atop the rocket at Kennedy Space Center’s Launch Complex 39A in Florida, in preparation for Demo-1. Boeing’s CST-100 Starliner continues to undergo testing in preparation for its Orbital Flight Test, and United Launch Alliance is conducting final processing of the Atlas V rocket that will launch Starliner from Space Launch Complex 41 at Cape Canaveral Air Force Station in Florida. NASA’s Commercial Crew Program will return human spaceflight launches to U.S. soil, providing safe, reliable and cost-effective access to low-Earth orbit and the space station on systems that meet safety and performance requirements. To meet NASA’s requirements, the commercial providers must demonstrate their systems are ready to begin regular flights to the space station. After the uncrewed flight tests, Boeing and SpaceX will complete a flight test with crew prior to being certified by NASA for crew rotation missions. The following planning dates reflect inputs by the Commercial Crew Program and the two companies and are current as of Feb. 4, 2019. SpaceX also completed a pad abort test in 2015. Following the test flights, NASA will review performance data and resolve any necessary issues to certify the systems for operational missions. Boeing, SpaceX and the Commercial Crew Program are actively working to be ready for the operational missions. As with all human spaceflight vehicle development, learning from each test and adjusting as necessary to reduce risk to the crew may override planning dates. Boeing technicians carefully close Starliner’s shipping container at the company’s Florida factory ahead of its trip to El Segundo, Calif. 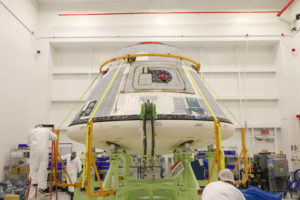 The Boeing CST-100 Starliner spacecraft destined to fly astronauts to the International Space Station for Boeing’s Crew Flight Test (CFT) as part of NASA’s Commercial Crew Program is ready to undergo a series of flight-like simulations similar to the actual environments the spacecraft will experience during different stages of flight. Boeing’s first crewed Starliner finished initial production at Kennedy Space Center, Fla. and is readied for its cross-country trip. 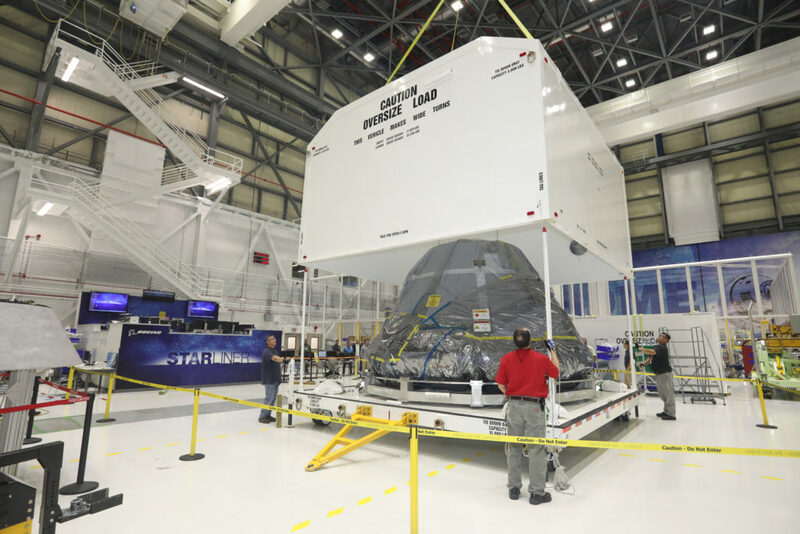 The spacecraft recently arrived at the company’s facilities in El Segundo, California for the series of tests. 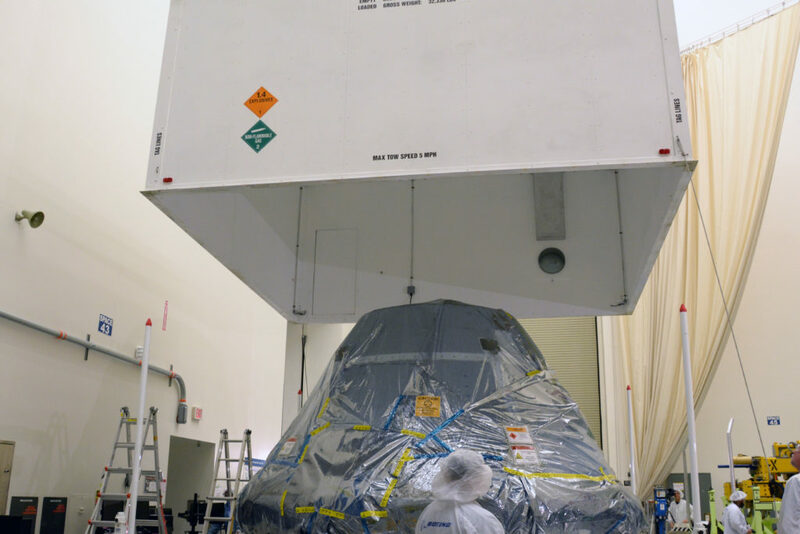 In order to ship the spacecraft, technicians painstakingly prepared and secured Starliner inside its shipping container on Nov. 12, before the spacecraft completed its 10-day, cross-country trip. Now, Starliner will begin the test campaign wherein acoustic and vibration testing will simulate the environment during launch and ascent, thermal vacuum testing will expose Starliner to the extreme heat and cold it will experience in orbit, and electromagnetic interference/electromagnetic compatibility testing will make sure that those signals or radiation do not interfere with operations on Starliner or with sensitive equipment on station. The series of tests are expected to last about three months. Starliner is unboxed inside Boeing’s satellite test facilities in California to prepare for environmental qualification testing. The company’s CFT is targeted for August 2019, and will be Starliner’s first flight with crew onboard. Following the CFT, Boeing will refurbish the spacecraft for regular crewed missions to the space station. During these environmental tests, Boeing also expects to complete production in its Florida factory on the Starliner to be flown in the company’s uncrewed Orbital Flight Test, targeted for March 2019. 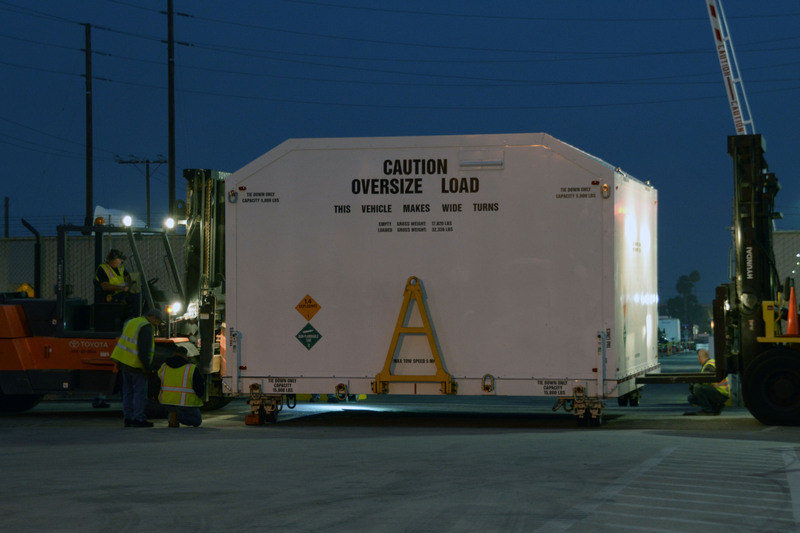 The shipping container with Starliner’s crew module arrives at Boeing’s facilities in El Segundo, Calif.
Boeing is developing the Starliner spacecraft as part of NASA’s Commercial Crew Program. The spacecraft will launch on a United Launch Alliance Atlas V rocket from Space Launch Complex 41 on Cape Canaveral Air Force Station in Florida. The next generation of American spacecraft and rockets that will launch astronauts to the International Space Station are nearing the final stages of development and evaluation. NASA’s Commercial Crew Program will return human spaceflight launches to U.S. soil, providing safe, reliable and cost-effective access to low-Earth orbit on systems that meet our safety and mission requirements. 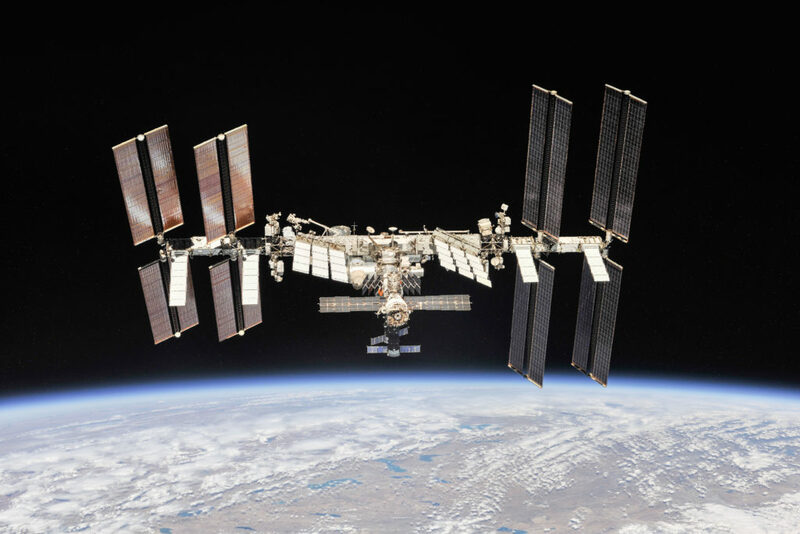 To meet NASA’s requirements, the commercial providers must demonstrate that their systems are ready to begin regular flights to the space station. Two of those demonstrations are uncrewed flight tests, known as Orbital Flight Test for Boeing, and Demo-1 for SpaceX. After the uncrewed flight tests, both companies will carry out spacecraft abort tests to demonstrate their crew escape capability during an actual on-pad, or ascent emergency. The final test flights for each company will be crew flight tests to the space station prior to being certified by NASA for crew rotation missions. The following target dates reflect the current schedule as of Thursday, Jan. 10. SpaceX also completed a pad abort test in 2015. Following the test flights, NASA will review the performance data and resolve issues as necessary to certify the systems for operational missions. Boeing, SpaceX and the Commercial Crew Program are actively working to be ready for the operational missions; however, as with all human spaceflight development, learning from each test and adjusting as necessary to reduce risk to the crew may override planning dates. NASA astronauts Mike Hopkins and Bob Behnken at SpaceX’s Rocket Development Facility in McGregor, Texas. 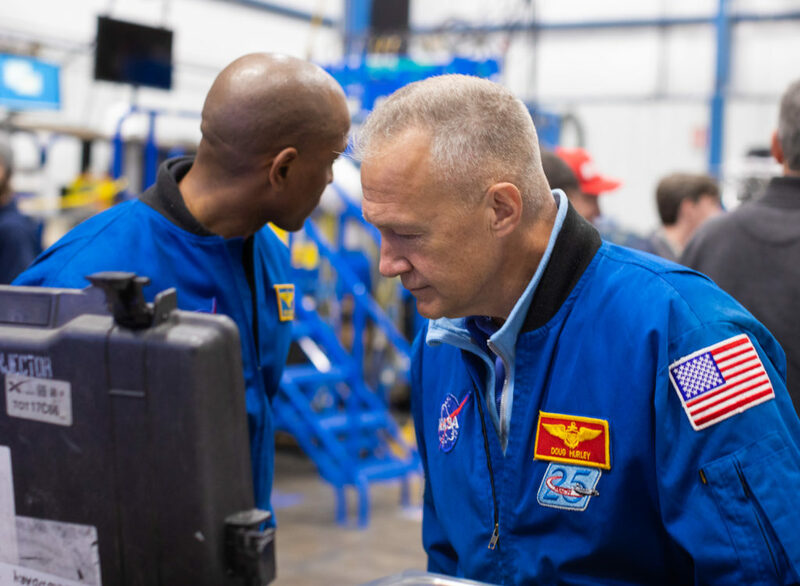 NASA astronauts who will be the first humans to fly aboard SpaceX’s Crew Dragon spacecraft recently toured the company’s Rocket Development Test Facility in McGregor, Texas. NASA astronauts Bob Behnken and Doug Hurley at SpaceX’s Rocket Development Facility in McGregor, Texas. 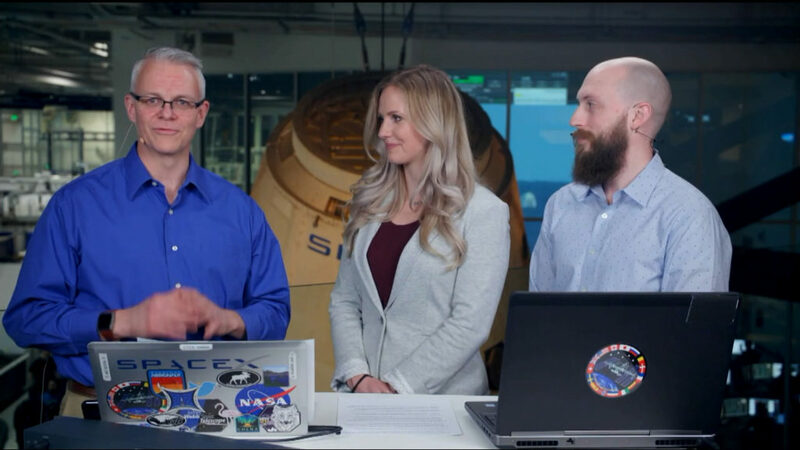 NASA astronauts Bob Behnken and Doug Hurley are set to crew SpaceX’s Demo-2 flight test in June 2019, which will be the first flight of Crew Dragon with people onboard. NASA astronauts Victor Glover and Mike Hopkins at SpaceX’s Rocket Development Facility in McGregor, Texas. NASA astronauts Victor Glover and Mike Hopkins will crew SpaceX’s first regular mission to the International Space Station, following Demo-2 and NASA’s certification of SpaceX commercial crew systems. NASA astronaut Doug Hurley at SpaceX’s Rocket Development Facility in McGregor, Texas. NASA’s Commercial Crew Program is working with SpaceX and with Boeing to return human spaceflight launch capability from the United States. NASA astronaut Bob Behnken at SpaceX’s Rocket Development Facility in McGregor, Texas.